Performance-based conservation has long been recognized as crucial to improving program effectiveness, particularly when environmental conditions are dynamic. Yet few studies have investigated the use of environmental performance information by staff of conservation organizations. This article identifies attitudinal, policy and organizational factors influencing the use of a type of performance information—water quality information—by Soil and Water Conservation District staff in the Upper Mississippi River Basin region. An online survey (n = 277) revealed a number of important variables associated with greater information use. Variables included employees’ prosocial motivation, or the belief that they helped people and natural resources through their job, the perceived trustworthiness of data, the presence of a U.S. Clean Water Act Total Maximum Daily Load standard designation, and staff discretion to prioritize programs locally. 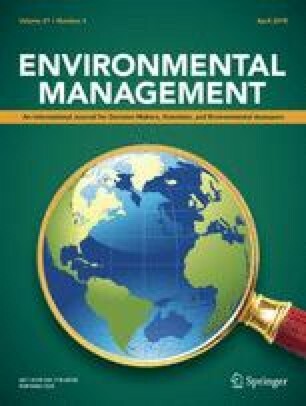 Conservation programs that retain motivated staff and provide them the resources and flexibility to plan and evaluate their work with environmental data may increase conservation effectiveness under changing conditions. Chloe Bradley Wardropper was formerly at Nelson Institute for Environmental Studies, University of Wisconsin-Madison, USA. The online version of this article ( https://doi.org/10.1007/s00267-017-0990-5) contains supplementary material, which is available to authorized users. This work was supported by National Science Foundation Water Sustainability and Climate grant DEB 1038759 and Integrative Graduate Education and Research Training (IGERT) DGE 1144752. I appreciate insightful comments on the manuscript from Adena Rissman and Don Moynihan, and from anonymous reviewers. Thanks to all the Conservation District and state Agriculture Department staff who participated in this study, and for their ongoing work.